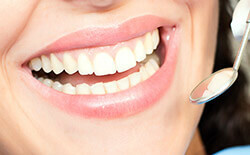 Have you had a crown, bridge, inlay, or onlay placed in your smile before? These restorative solutions can do wonders for the patient’s oral function and health, but in the past, patients often had to settle for gold or silver materials that stood out noticeably, marring their beautifully natural appearance. If you’re looking for the perfect blend of cosmetic shine and revitalizing quality, contact our Columbia, MO office today. Patients from Centralia, Fulton, Ashland, Hallsville, and beyond can enjoy all-ceramic restorations that are durable and personalized for a seamlessly lifelike look. At Columbia Healthy Smiles, Dr. Philip Batson and his team are dedicated to providing patients of all ages with the compassionate, long-term care their smiles deserve. When your new crown or bridge is fabricated from high-strength ceramic, you’ll be amazed by the benefits that follow. The restoration is very biocompatible, durable, and naturally beautiful in a lifelike way. They even reflect light like a natural tooth, and patients won’t have to worry about metal bands forming near the gum line. If you’re dissatisfied with your current crown or bridge, talk to Dr. Batson here in Columbia, MO about having them replaced with this exceptional alternative. If the cusp of one of your teeth needs additional support or if a third of its structure is already composed of filling material, an inlay or onlay could be the best choice for your smile. These restorations beautifully restore areas of damage or decay while also strengthening the natural structure that’s left.